Gastronorm containers in Tritan with no Bisphenol A. With the same characteristics as polycarbonate gastronorm containers, these Tritan (copolyester) containers have the advantage of being free from BPA. Rigid and unbreakable, these containers can be placed in the dishwasher and can withstand freezing or cooking temperatures (-40 to +110°C). BPA free gastronorm container 1/2 in copolyester. Height 10 cm. Gastronorm container 1/2 10 cm in Tritan (copolyester). BPA free. For presenting, preparing and preserving food. Hardwearing and stackable container. Compliant with the EU food norm EN 631-1. -40° to +110°C (-40° to 230° F). BPA free gastronorm container 1/6 in copolyester. Height 10 cm. Gastronorm container 1/6 10 cm in Tritan (copolyester). BPA free. For presenting, preparing and preserving food. Hardwearing and stackable container. Compliant with the EU food norm EN 631-1. -40° to +110°C (-40° to 230° F). BPA free gastronorm container 1/2 in copolyester. Height 20 cm. Gastronorm container 1/2 20 cm in Tritan (copolyester). BPA free. For presenting, preparing and preserving food. Hardwearing and stackable container. Compliant with the EU food norm EN 631-1. -40° to +110°C (-40° to 230° F). Lid for BPA free gastronorm container 1/2 in copolyester. Lid for gastronorm container 1/2 in Tritan (copolyester). BPA free. Compliant with the EU food standard EN 631-1. -40° to +110°C (-40° to 230° F). BPA free gastronorm container 1/4 in copolyester. Height 15 cm. Gastronorm container 1/4 15 cm in Tritan (copolyester). BPA free. For presenting, preparing and preserving food. Hardwearing and stackable container. Compliant with the EU food norm EN 631-1. -40° to +110°C (-40° to 230° F). 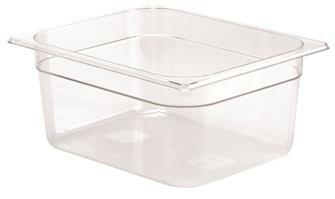 Drainer plate for BPA free gastronorm container 1/1 in copolyester. 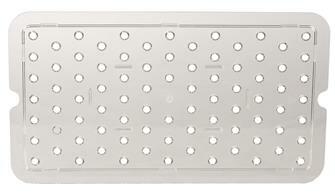 Drainer plate for gastronorm container 1/1 in Tritan (copolyester). BPA free. Compliant with the EU food standard EN 631-1. -40° to +110°C (-40° to 230° F). BPA free gastronorm container 1/1 in copolyester. Height 6.5 cm. 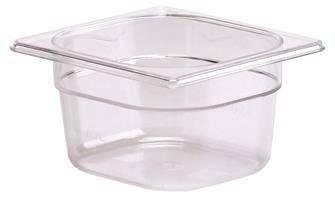 Gastronorm container 1/1 6.5 cm in Tritan (copolyester). BPA free. For presenting, preparing and preserving food. Hardwearing and stackable container. Compliant with the EU food norm EN 631-1. -40° to +110°C (-40° to 230° F). BPA free gastronorm container 1/1 in copolyester. Height 15 cm. 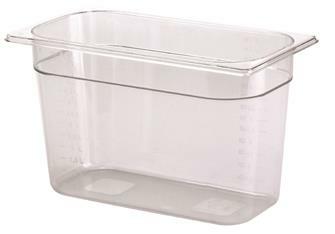 Gastronorm container 1/1 15 cm in Tritan (copolyester). BPA free. For presenting, preparing and preserving food. Hardwearing and stackable container. Compliant with the EU food norm EN 631-1. -40° to +110°C (-40° to 230° F). BPA free gastronorm container 1/9 in copolyester. Height 6.5 cm. 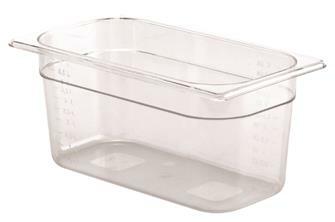 Gastronorm container 1/9 6.5 cm in Tritan (copolyester). BPA free. For presenting, preparing and preserving food. Hardwearing and stackable container. Compliant with the EU food norm EN 631-1. -40° to +110°C (-40° to 230° F). BPA free gastronorm container 1/2 in copolyester. Height 6.5 cm. 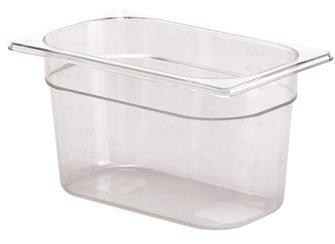 Gastronorm container 1/2 6.5 cm in Tritan (copolyester). BPA free. For presenting, preparing and preserving food. Hardwearing and stackable container. Compliant with the EU food norm EN 631-1. -40° to +110°C (-40° to 230° F). Lid for BPA free gastronorm container 1/4 in copolyester. Lid for gastronorm container 1/4 in Tritan (copolyester). BPA free. Compliant with the EU food standard EN 631-1. -40° to +110°C (-40° to 230° F). Lid for BPA free gastronorm container 1/9 in copolyester. Lid for gastronorm container 1/9 in Tritan (copolyester). BPA free. Compliant with the EU food standard EN 631-1. -40° to +110°C (-40° to 230° F). BPA free gastronorm container 1/3 in copolyester. Height 15 cm. Gastronorm container 1/3 15 cm in Tritan (copolyester). BPA free. For presenting, preparing and preserving food. Hardwearing and stackable container. Compliant with the EU food norm EN 631-1. -40° to +110°C (-40° to 230° F). 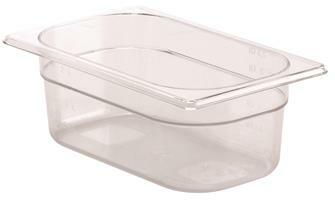 Drainer plate for BPA free gastronorm container 1/2 in copolyester. 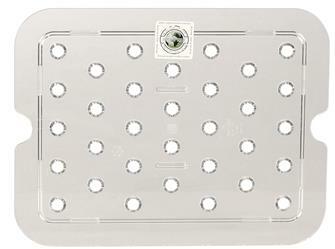 Drainer plate for gastronorm container 1/2 in Tritan (copolyester). BPA free. Compliant with the EU food standard EN 631-1. -40° to +110°C (-40° to 230° F). BPA free gastronorm container 1/4 in copolyester. Height 10 cm. Gastronorm container 1/4 10 cm in Tritan (copolyester). BPA free. For presenting, preparing and preserving food. Hardwearing and stackable container. Compliant with the EU food norm EN 631-1. -40° to +110°C (-40° to 230° F). BPA free gastronorm container 1/6 in copolyester. Height 6.5 cm. 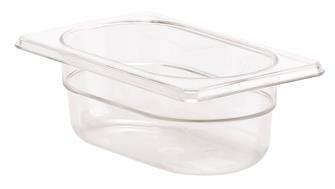 Gastronorm container 1/6 6.5 cm in Tritan (copolyester). BPA free. For presenting, preparing and preserving food. Hardwearing and stackable container. Compliant with the EU food norm EN 631-1. -40° to +110°C (-40° to 230° F). BPA free gastronorm container 1/3 in copolyester. Height: 6.5 cm. Gastronorm container 1/3 6.5 cm in Tritan (copolyester). BPA free. Ideal for replacing polycarbonate containers. Compliant with the EU food standard EN 631-1. -40° to +110°C (-40° to 230° F). Lid for BPA free gastronorm container 1/1 in copolyester. Lid for gastronorm container 1/1 in Tritan (copolyester). BPA free. Compliant with the EU food standard EN 631-1. -40° to +110°C (-40° to 230° F). BPA free gastronorm container 1/1 in copolyester. Height 10 cm. 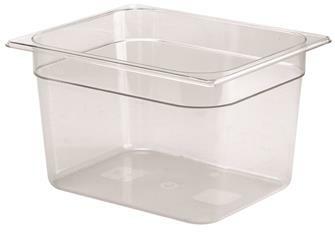 Gastronorm container 1/1 10 cm in Tritan (copolyester). BPA free. For presenting, preparing and preserving food. Hardwearing and stackable container. Compliant with the EU food norm EN 631-1. -40° to +110°C (-40° to 230° F). Lid for BPA free gastronorm container 1/3 in copolyester. Lid for gastronorm container 1/3 in Tritan (copolyester). BPA free. Compliant with the EU food standard EN 631-1. -40° to +110°C (-40° to 230° F). BPA free gastronorm container 1/2 in copolyester. Height 15 cm. Gastronorm container 1/2 15 cm in Tritan (copolyester). BPA free. For presenting, preparing and preserving food. Hardwearing and stackable container. Compliant with the EU food norm EN 631-1. -40° to +110°C (-40° to 230° F). Lid for BPA free gastronorm container 1/6 in copolyester. Lid for gastronorm container 1/6 in Tritan (copolyester). BPA free. Compliant with the EU food standard EN 631-1. -40° to +110°C (-40° to 230° F). BPA free gastronorm container 1/3 in copolyester. Height 10 cm. Gastronorm container 1/3 10 cm in Tritan (copolyester). BPA free. For presenting, preparing and preserving food. Hardwearing and stackable container. Compliant with the EU food norm EN 631-1. -40° to +110°C (-40° to 230° F). BPA free gastronorm container 1/3 in copolyester. Height 20 cm. Gastronorm container 1/3 20 cm in Tritan (copolyester). BPA free. For presenting, preparing and preserving food. Hardwearing and stackable container. Compliant with the EU food norm EN 631-1. -40° to +110°C (-40° to 230° F).